The East Tennessee Historical Society recently received three Awards of Excellence by the Tennessee Association of Museums (TAM) for exhibits, education programs, and digital media. 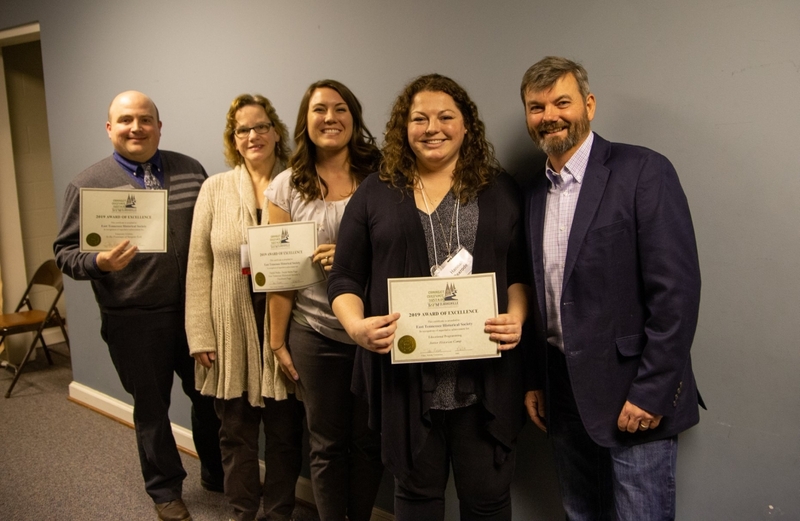 The awards were presented at the Tennessee Association of Museums Conference held March 20, in Clarksville, Tennessee. Two of the projects were also nominated for the President’s Award, the highest project-based recognition presented by the Tennessee Association of Museums. An Award of Excellence was presented to In the Footsteps of Sergeant York for best temporary exhibit. The exhibit, previously on view at the Museum of East Tennessee History January through August 2018, was from the Museum of the American Military Experience, with ETHS augmenting the exhibition with a local component of East Tennessee stories and artifacts. The award-winning exhibition, which told the story of the Fentress County-native’s heroic stand against overwhelming odds to be awarded the Medal of Honor, featured a life-sized trench, numerous battlefield and personal artifacts, film footage, and audio visual components to personalize the visitor experience. The exhibit also facilitated a variety of well-received public programs, lectures, film showings, and partnerships with the Sergeant York Patriotic Foundation, Tennessee State Parks, UT Center for the Study of War and Society, and the State of Tennessee World War I Commission. ETHS’s new “Junior Historian Camp” for children was the recipient of an Award of Excellence in the Educational Programming category. Junior Historian Camp gave 20 young participants the opportunity to step away from textbooks and internet sites to experience the diverse history of Knoxville first-hand. The week-long summer camp included a variety of museum related and regional history topics; including a behind the scenes look at the museum, early Tennessee history, Knoxville in the 20th Century, and historic house museums. The children enjoyed walking tours of the city, field trips to downtown’s museums, vintage baseball game, crafts modeled after artifacts in the ETHS collections, East Tennessee jeopardy games, and a graduation ceremony where they became “Junior Historians.” The 2019 Junior Historian Camp, for ages 9-13, will be held June 24-28. ETHS also won an Award of Excellence for digital media for the ETHS Facebook page. The ETHS Facebook page is used as an educational outreach tool to not only promote the events and happenings of ETHS, but also other historical and genealogical organizations and museums across the region. The page features a “This day in East Tennessee history,” as well as new artifacts in the museum, programs, and news from around the region. The page has had an astounding impact in sharing the region’s history while helping to generate public awareness, conversations, and shared memories about our local history, with a total reach of 948,838 views in 2018, a 98% increase over the prior year. The purpose of the TAM Awards of Excellence is to recognize, encourage, and promote excellence within the activities of the Tennessee museum community. Nominations are made either by museum staff or community individuals and are submitted in January to regional representatives for adjudication. Each entry is presented to the TAM Awards Committee, composed of six regional representatives, two at-large members, and the committee chair. The committee makes the final decisions for the awards. Awards are based on creativity, originality, resourcefulness, success, support of museum mission statement, and utilization of staff and volunteers. Founded in 1960, the Tennessee Association of Museums fosters communication and cooperation between museums, cultural societies, and other members on matters of common interest to all. Our goal is to inform the public on the importance of understanding and preserving Tennessee's cultural, historical, and scientific heritage. We also encourage publication and dissemination of information on the state's past as well as the development of professional standards of members who bring that past to the public. The organization is currently comprised of more than 100 museums and historic sites from across the state.